and included in Chipmunk 7! huge interactive world is driven by Chipmunk2D. both for free and Pro Chipmunk2D. Feed Me Oil, which reached top spot on the App Store. Chipmunk2D Pro can save weeks of development time, with flexible licensing options for organizations of any size. Learn how Chipmunk2D Pro can help you. 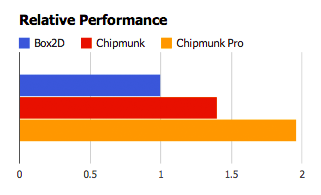 Also, by purchasing Pro, you help us to afford the time that we spend improving Chipmunk2D. Loads of tutorials and examples. 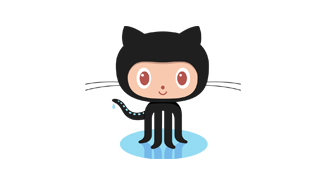 Get the code on Github! The Chipmunk2D C library is free and MIT Licensed. Active community with many language bindings available. 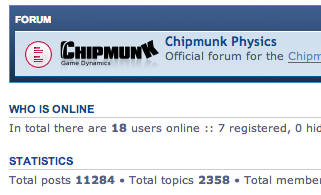 Chipmunk2D has an active community of thousands of users making games for many different platforms. With Chipmunk2D's large collection of examples, you'll be developing games faster and more easily than ever before. Snap! Physics is one completed game example that uses our Objective Chipmunk2D binding. Want to throw a logo on your splash screen to show how much you appreciate Chipmunk2D? Frank Condello was gracious enough to make a logo for me. A couple variations are available here. Erin Catto's Box2D code was the most useful reference that I used when creating Chipmunk. His contact persistence algorithm is the main reason why Chipmunk2D is so fast. The best article I could find on spatial hashing. Their hash function seems to perform very well. My previous implementation was based on this paper. 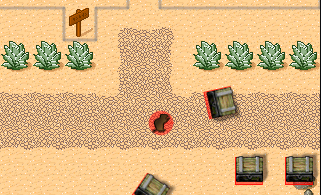 I only implemented part of the algorithm before deciding that something simpler would be better suited for real time. I do use the split elastic solving pass in newer versions of Chipmunk2D however. This book is a good reference for a lot of the math you'll need, but is far from a good reference on implementing a physics engine.